Customs is one of the few common experiences that all Haverfordians have, and, like the Honor Code, everyone has a different opinion about it. In some sense, Customs is an important part of the glue that brings the community together by providing that common base of experience. Yet in another sense, it's nothing more than a support network put in-place to help students if they need it. What one can be safe in saying, however, is that Customs is a yearlong program that involves nearly 200 upperclass students supporting, in a multiplicity of ways, the first-year class in their transition from high school to college life at Haverford. Most first-year halls or HCA buildings house between eight and sixteen first-year students, called Customs Groups, as well as a few on-hall resource people. Living on the hall are two Customs People (CPs) and one Upper-Class Advisor (UCA). The Customs Person's primary role is, if needed, to serve as an all-around support person to their Customs Group. The hall's UCA is a trained academic advisor who, along with the Faculty Advisor, facilitates the new students' navigation through Haverford's academic requirements. Customs Groups are also supported by one or two Honor Code Orienteers (HCOs), one Ambassador for Multicultural Awareness (AMA), and one or two Peer Awareness Facilitators (PAFs), each of which lives off the hall. HCOs are responsible for introducing and explaining the Haverford Honor Code to the first year students. AMAs heighten awareness and increase campus-wide participation in cross-cultural and multicultural programs, activities and understanding. PAFs facilitate a series of eight weekly Customs Group discussions about topics that Haverford students feel are particularly important to student life in college. Customs Week antics, c. 1948. Visit the Haverblog for more Customs photos. Customs is arguably Haverford's oldest tradition. Its roots reach back to the mid-1800s when upperclassmen spontaneously began keeping the peace in Barclay, the College's first dorm, by quieting the rowdy underclassmen and teaching the new students the 'customs' of the College. 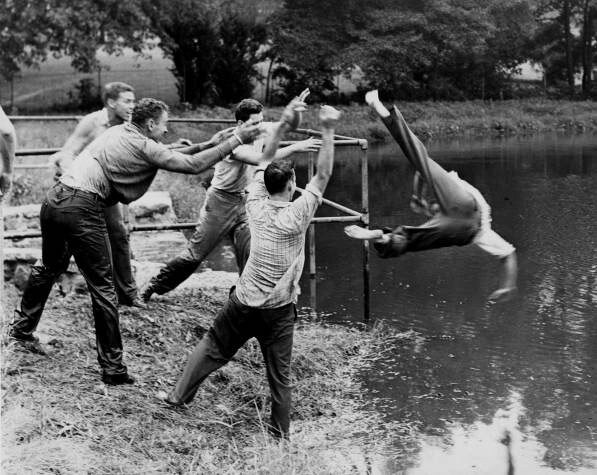 At that time, this usually took the form of tossing the frosh head-first into the Duck Pond. The modern program is, however, above such draconian "welcoming" tactics and now seeks to provide the support and resources that entering students need to make a smooth transition from high school to college life at Haverford.